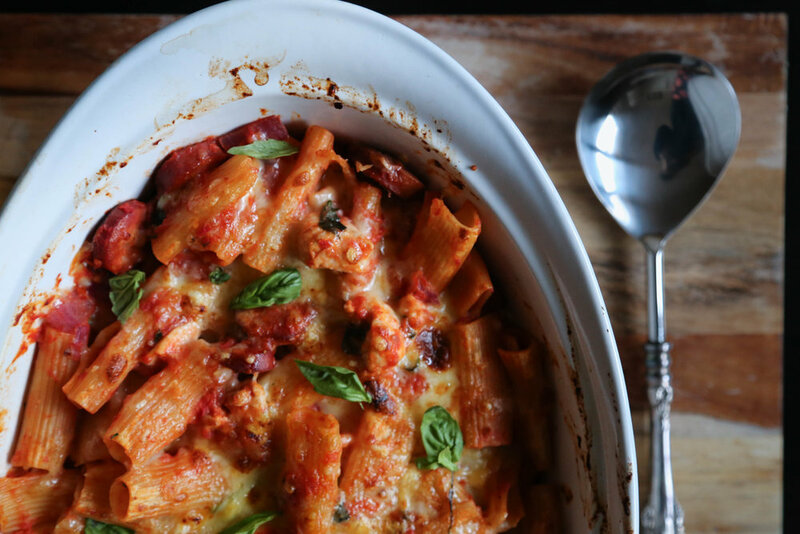 Cheesy, chunky pasta bake. The pleaser of all crowd pleasers. Rigatoni is one of my guilty winter pleasures because it's dense and grounding. The original recipe that inspired this awesome dinner dish is from the The Australian Women's Weekly Quick Family Meals, and it's full of great recipes for those of us that tend to throw dinner together in a mid week hurry. Lately, I've been cooking up a storm on Sunday nights and then spend the rest of the week heating and serving up the fruits of my weekend's labour. With this particular recipe, I substituted bacon with chorizo because I happened to have some in the fridge, plus it added another chunky (and scrumptious) element to the dish. A winner with the husband, this recipe tastes as good as it looks and it's even better on the second day. Cook the pasta in a large pot of boiling water until tender. Drain and return to pan. Meanwhile, heat half the oil in a large frying pan over high heat. Cook the chicken until browned, then remove from pan. Heat the remaining oil, cook the sliced chorizo and red onion until the chorizo is seared on the edges. Return chicken to the pan of chorizo, add the sauce and simmer for ten minutes. Add the basil to the sauce, season with salt and pepper to taste. Pour the sauce/meat mixture over the pasta, and fold until combined. Stir through half the cheese and spoon the pasta into a 2 litre oven proof dish. Top with remaining cheese. Bake uncovered for 10 minutes, or until the cheese has lightly browned. Sprinkle with extra basil to serve.